Climate change is already impacting the lives of many, right here and right now. The fingerprints of global warming can be found on natural disasters ranging from intense wildfires and frequent floodings, causing over $1 trillion in damages to the U.S. over the past 30 years. Hurricane Sandy in the Northeast, Hurricane Matthew in the Southeast coast, and the continued drought and the Soberanes Fire in California are just a few examples of devastating consequences of climate change. 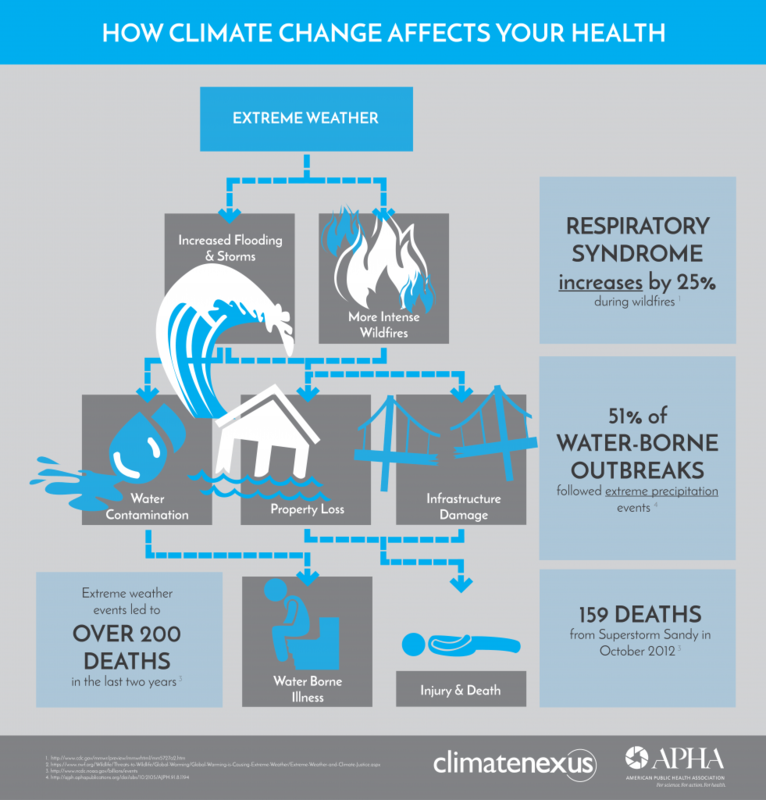 These extreme weather events put vulnerable populations, such as communities of color, the elderly, young children, the poor and those with chronic illnesses, to bear the bigger burden of injury, disease and death. The human and financial tolls from extreme weather events are difficult to fully calculate. According to the International Disaster Database, about 12,400 Americans died and more than 26 million were impacted between 1980 to 2010 due to natural disasters. Waterborne illness: National Institute of Environmental Health Sciences states that waterborne illnesses often spread after a severe precipitation event. Microorganisms and toxins that are spread through water can cause illnesses such as cholera, schistosomiasis and other gastrointestinal problems. Injury & death: According to PublicHealth.org, during and after a natural disaster, water, food and shelters can become scarce, which can increase the risk of starvation, dehydration, malnutrition and interrupted health services, potentially leading to injury and even death. For more information on the science of how climate change causes extreme heat and heatwaves, visit Climate Signals.